It’s Facebook Friday — each week we’ll offer one tip for leveraging Facebook to increase customer awareness of and engagement with your brand or business. This week, we have a tip for using Facebook (and Twitter) with Sprout Social. While using Twitter and Facebook are great ways to connect with customers, promote products, and resolve customer service problems, we’ve seen that social media isn’t always free from mistakes made by companies. With the recent number of public scandals and snafus, it’s not uncommon to ask a team member to review tweets and Facebook posts before they’re sent. 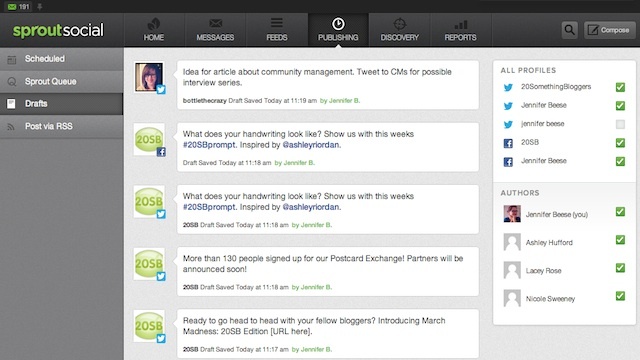 To simplify the review process, we’ve added drafting and approval features to Sprout Social’s publishing tools. With ‘Draft for Approval,’ community managers and their teams have better visibility and control over your company’s outgoing messages. Using the feature is very simple and below we’ll show you how. First you’ll want to login to your Sprout Social account and click on the Compose button — just as you normally would when preparing to send a tweet or Facebook post. Before you start typing, click on the Draft button (first icon on the left) next to Send. You’ll see that the Send button will change to Save. We recommend clicking Draft first to ensure you don’t accidentally send something that’s meant for review. If you’re using the Queue Chrome Extension, the process is essentially the same. But instead of going to sproutsocial.com, you’ll tap the icon in your browser toolbar to open the Compose box. Similar to the web version, the Draft button is to the left of the Send button. Once you’re comfortable with your draft, click Save. Drafts will be shared with your team, just like Scheduled and Queued messages. To access existing drafts, click on the Publishing tab and find ‘Drafts’ in the menu along the left-hand side of the screen. By default, when you open an existing draft for review, it will automatically prompt you to send. If you’d like to continue working without sending, just click on the Draft icon again — the Send button will change to Save. From here, you can edit the draft, or if you’re happy with it, add the tweet or Facebook post to your Sprout Queue or schedule it for later. You can also select “Discard” to remove the drafts that haven’t been approved. One of the major benefits of this feature is that Drafts are shared with your team and are available for all plans. 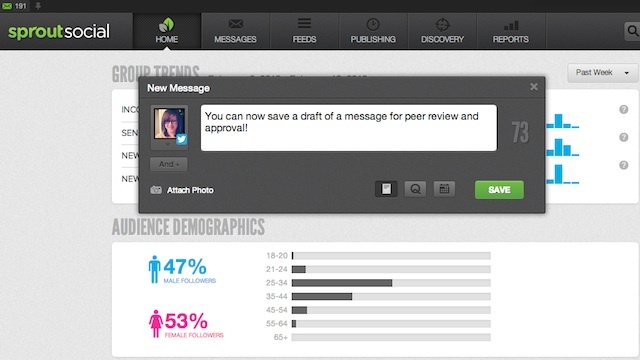 This means that you can save messages for a manager or peer to review and approve, or reject with a note. For example, if you’re solving a customer service problem, but aren’t sure if you’ve provided the correct answer, you can save a draft and ask one of your developers or customer support reps to review your tweet. Or maybe you’re launching a new feature and you have some ideas about how to tease the release on Facebook. Don’t let a good idea pass you by while you wait for approval. 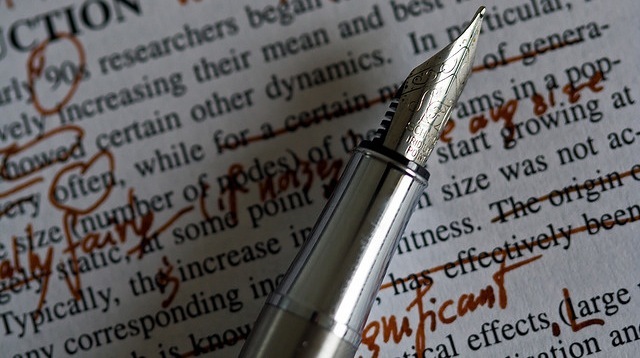 With Drafts, you can jot down your ideas for posts and save the content for your team to review. Have an idea on the go? Save it as a draft on Sprout’s mobile app to review or have approved later. Additionally, other team members might have creative ideas for tweets or Facebook posts. Instead of cluttering your inbox, they can save those ideas as drafts, which you can review the next time you’re logged in to your account. Whether you’re a team of one or many, Drafts can help you collect thoughts and keep your publishing calendar stocked with great content.